Body & Soul: Diana & Kathy premiered October 2009. The film Body & Soul: Diana & Kathy chronicles the lives of two of the country's most remarkable advocates for people with disabilities. Diana Braun, who has Down syndrome, and Kathy Conour, who has cerebral palsy, met three decades ago and vowed to fight to live independent lives. Fearful of being shut away in a nursing home or forced into a state-run institution, Diana and Kathy broke the rules, escaped the system, and modeled a grand experiment in independent living. Diana and Kathy participate in the democratic process by visiting their congressional representatives.Dean Williams and Associates As a result of their efforts, today Diana and Kathy are well-known as a tireless and dynamic pair of lobbyists and activists in the disability movement. Although Kathy is non-verbal, through the help of a mouth stick and the Pathfinder assistive communication device, she writes articles for national magazines and has a lively email correspondence with leaders in the disability rights movement. Kathy also serves on boards, and continues to lobby effectively for disability rights—Kathy was once even arrested, power chair and all. Diana drives, cooks, shops, takes care of scheduling doctor's appointments and has been Kathy's personal assistant and friend for more than 35 years. The film chronicles a journey from their home in Springfield, Ill. to Washington, D.C.. The trip is physically dangerous and technically illegal—Medicare rules require them to be homebound. However, history has shown the benefits of breaking rules can sometimes outweigh the risks. Although they comprise the largest minority in the United States, people with disabilities are routinely denied equal access and rights. 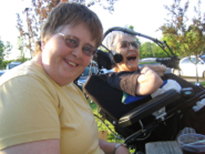 Body & Soul: Diana & Kathy exemplifies the abilities of people with disabilities and helps us understand an important and complex social issue. The film almost didn't happen, however. When Diana Braun and Kathy Conour approached Alice Elliott and asked her to make a film about them, Alice was reluctant. She had just spent five years making her previous film, the Academy Award® nominated short documentary The Collector of Bedford Street, and wasn't ready to plunge into another project. Diana and Kathy travel the country screening Body & Soul: Diana & Kathy and work as tireless advocates for people with disabilities.Alice Elliott It had been Kathy's life long dream to have a documentary made about her, so she wouldn't give up. After visiting Diana and Kathy in Springfield, Ill., Alice realized what unique subjects they would be and was won over by Kathy's persistence. For five years, Diana and Kathy gave Alice complete access to their lives. During that time, they filmed in Washington, D.C., as well as Chicago and Springfield. Told in an intimate, vérité style, Body & Soul: Diana & Kathy brings audiences into a private world and sweeps us into a way of life rarely seen on screen and seldom understood. The film has received a number of awards and recognitions, including a nomination from the International Documentary Association for the Distinguished Short Documentary Award and the TASH Positive Images in Media Award (shared with Including Samuel). The film was produced, directed, and filmed by Alice Elliott (The Collector of Bedford Street) and edited by Rose Rosenblatt (The Education of Shelby Knox, Live Free or Die), original music by Rick Baitz. Body & Soul: Diana & Kathy is a co-production of Alice Elliott and the Independent Television Service (ITVS), with funding provided by the Corporation for Public Broadcasting. It is with deep sadness that we report the passing of Kathy Conour. Kathy was a truly incredible person who is survived by her family, friends and her legacy of activism in the disability community. 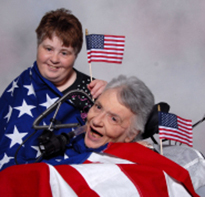 Her friend and caretaker of 42 years, Diana Braun, will continue advocating for people with disabilities and traveling the country sharing their story. It is our hope that Kathy's dream of advocating for, and educating people about, the disability community can be further realized through the upcoming national PBS broadcast of Body & Soul: Diana & Kathy. The broadcast of this powerful documentary will allow thousands of people to experience the inspirational story of these two lifelong friends. A memorial service for Kathy Conour was held on October 10th in Springfield, IL. Kathy's obituary can be found here. To read more about Kathy Conour, her life and her work check out Dave Bakke's article, "Kathy's Spirit Lives on in Diana" in The State Journal Register of Springfield, IL and her biography on our website, Welcome Change Productions. Body & Soul: Diana & Kathy was directed and produced by Alice Elliott and co-produced by Simone Pero, For Impact Productions, LLC. The American Association on Intellectual and Developmental Disabilites is the oldest and largest interdisciplinary organization of professionals and citizens concerned about intellectual and developmental disabilities. The American Network of Community Options and Resources is a nonprofit trade association representing private providers who provide supports and services to people with disabilities. The Arc of the United States promotes services for the developmentally disabled as well as research and education on the prevention of mental retardation. The National Down Syndrome Society is a comprehensive information source on Down Syndrome. The National Organization on DisAbility raises disability awareness through programs and information. The National Assocation of Councils on Developmental Disabilities is a national organization for Developmental Disabilities Councils, agencies appointed by governors to represent and advocate for people with developmental disabilities. TASH is an international association of people with disabilities, their family members, other advocates, and professionals fighting for disability rights. United Cerebral Palsy advocates "Life without limits for people with disabilities."